The travel gods and goddesses were feeling generous today! I was able to change my flights and get home at a decent hour rather than midnight. I've been in DC this week and I'll be going back next week. All work-related but I'm helping instruct a course so it is a change of pace, interesting, and satisfying. What's not so satisfying? This sleeve of Williamsro (Ravelry link) that I worked on this week. 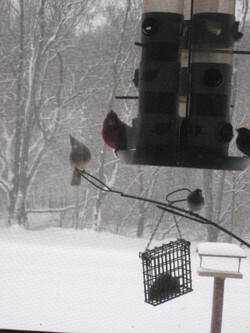 (Sorry about the photography...it is dark here and I had to lighten the exposure to have something to blog about.) I took Williamsro on the road to try to make some progress and I did. Sort of. 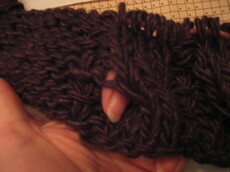 Anyway, there are at least three mistakes in the last fourth of the sleeve, so I'll be frogging back. One mistake and I might have just ignored it, but three is just too many for even me. 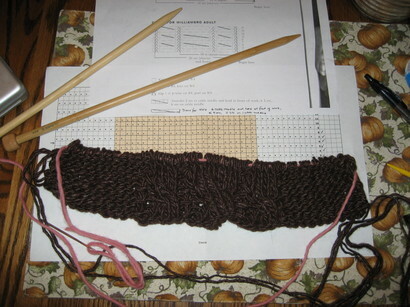 So look quickly blogless Aunt Jane and Stacey, here's knitting......since this is occasionally a knitting blog. 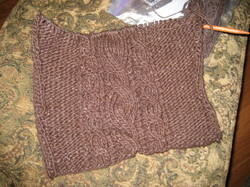 After I redo the sleeve, I'll start on the brown portion of the back. This should be a fairly quick knit.......if I spent any time with it. A welcome-home fire in the fireplace. It is 46 degrees right now and a fire is a nice condiment for the night. DH has some picadillo (with raisins and green olives) warming up and the rice is almost ready. Yum. (Yes, that translates as satisfying.) Have a good night all. Today has been pretty productive from my point of view especially since I'm still on "vacation." I divided and froze 13 servings of bean and vegetable soup. I'm almost through with laundering the flannel bedding. DH came down with a cold a few days ago and I am hoping freshly laundered flannel will help him sleep better. I found some new tires on sale for the Jeep and scheduled a time to have them installed (I think *install* is the right word.) 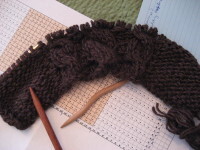 I knit several rows on Williamsro. Oh, and checked work email. 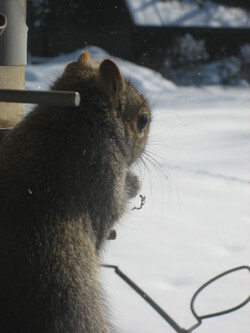 I've also been gazing out the window. 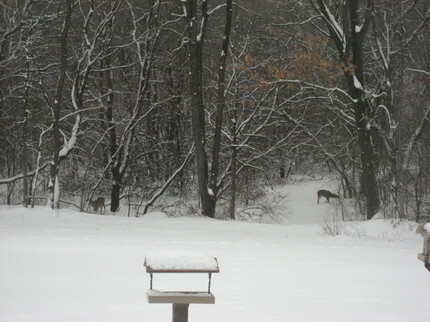 The deer are much more visible in the woods with the heavy snow cover. and White Dot checking out the koosh-factor of the first Williamsro sleeve in progress. I'm enjoying the pattern and the yarn (Noro's Cash Iroha) although I've come across one knot so far. The color is fairly true in these photos. No resolutions for me this new year--I never keep them anyway. I just hope to face the challenges of the new year with grace and to recognize and embrace the joys that life brings. I wish you all a Happy and Prosperous New Year! Today was a productive day without a lot to show for it. Well, I could photograph my dresser drawers that I inspected, organized and tossed appropriately worn-out garments. But, I'll spare you. I laundered, picked up piles of stuff around the house and put those piles of stuff in their proper places. The kitchen counter is now visable! I unpacked and repacked my suitcase. I fixed the TV in the bedroom so the satellite feed comes through. (How I did that is a mystery....I'm just happy it is working.) 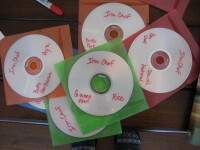 In general, it was a day of catching up and organizing. 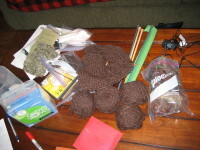 Speaking of knitting, TanyaTho on ravelry invited me to an informal KAL for Williamsro. This KAL will keep me motivated to keep on knitting. I didn't re-start Williamsro today but it is in my take-along bag of knitting so I'll be working on it this week. I hope to make some decent progress on this sweater in December so I'll be able to finish it during my Christmas vacation. Thanks, Tanya! 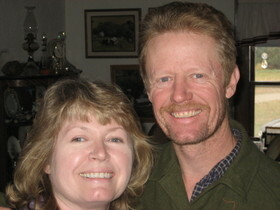 Here's another photo from the past week of me with my DB. It was a good vacation. 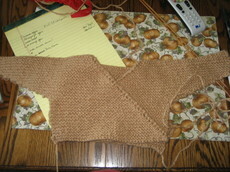 I had some time to knit a bit more on my sleeve swatch for Williamsro. 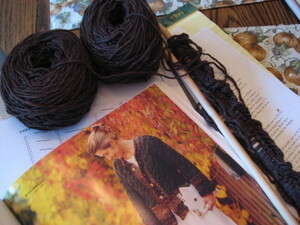 After I did the first cable crossing, it seemed a bit more lace-like than this cardigan should. 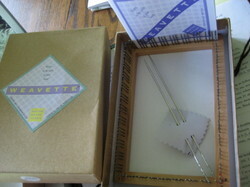 So, I thought that I perhaps should measure my gauge. I am usually a control-knitter, but my guage is off a quarter-inch over four inches (at least), indicating that I've relaxed a bit. (And the fabric is rather loose.) At this rate, I'll run out of yarn way before the sweater is finished....and I have extra. So, I'll switch out my US 13 needles for US 11 and see what happens next. It is certainly Autumn again here with the cooler temperatures. We were forecast for a possible light frost last night. 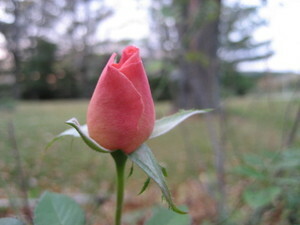 I was surprised to see this rose in the garden this time of year. Well, I'm actually surprised to see roses in my garden at any time of the year but that's a whole other issue. Because of the frost advisory, I cut the flower and it is now brightening my kitchen.